I can't decide what I want to do for my setup for 2014 - the problem is I have way too many awesome binders that I want to use! I've purchased a few more since my last collection post. I have an A5 Ochre Malden - I was using this as my work binder, but switched to an A5 Osterley in Grey. I thought the Osterley had a more polished professional look than the Malden. I think the Malden is rugged and timeless, perfect for to hold all of my reference information. So that one just needs to be set up. I have a new (to me) Franklin Covey classic binder. 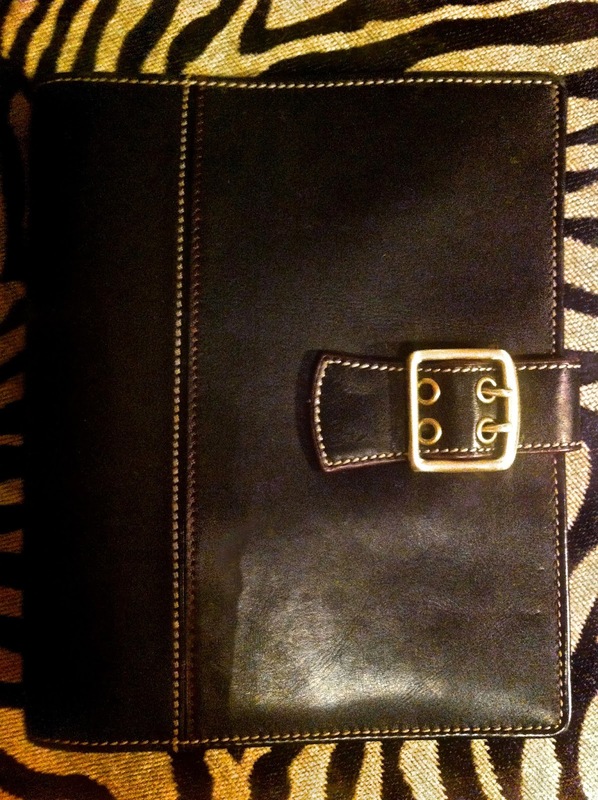 I think it is the Her Point of View binder in black from around 2007. It is full grain leather, the most buttery soft leather I have ever felt, seriously. I want to use this for everything. I bought it for work because I live in the US and it is so hard to find A5 paper and binders - especially with Filofax hole spacing (and I'm way too Type A to re-punch if I can see the 'wrong' holes)! So I have all my meeting notes in the A5 and I don't have a good way to archive them. I don't really want to spend at least $50 on an A5 binder to use just to store old meeting notes. I do reference my old notes occasionally, so I like to keep them and be able to leaf through them. Anyway, the FC classic size fits 5.5 x 8.5" paper and has common hole spacing to other US binders and planners - and has 1.25" rings! Moving from my personal size up to A5 size, and using the grey Osterley as my personal binder. Using the FC classic as my work binder. This would be costly, since I have all of my 2014 calendars, papers, etc. for the personal size and I'd have to re-buy for the A5. I like the idea because I would be able to fit more pages into my binder. I work from home, so I don't really have to lug around my planner too often. Stay in the personal size for my main personal Filo, and move to FC classic for work. Scrap the whole idea of moving - stay in the personal size for main personal Filo, and stay in A5 Osterley in Grey for work. If so, I need to find a use for my FC classic - it's just to amazing to sit around unused. So what do you think I should do? Please let me know in the comments, your input is greatly appreciated! Great idea, it may just come down to that. Thanks.